This is our all-time favorite Iced Tea! It’s refreshing, healthy and aromatic! We love the subtle lemon woodsy notes of lemongrass and the ginger kick. We cook with a lot of ginger too, so these flavors are close to home. 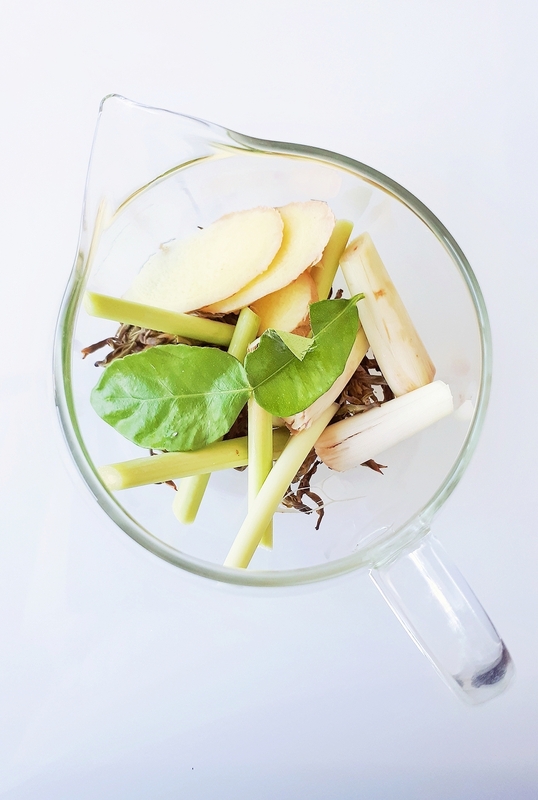 This recipe is quite balanced and delicate in taste (unlike your normal Ginger Tea) and can be adjusted to suit your personal liking. Simply adjust the amount of ingredients and brewing time for a stronger taste. Wash the lemongrass and peel off the tough outer layer. Using a sharp knife, trim 2 inches off the top end tip of the lemongrass (dry leafy part). Then cut half an inch of the root end, lower bulb. Crush the lemongrass root end bulb with the flat side of the knife to release the flavor and cut the entire lemongrass lengthwise into half. Option: You can cut the lemongrass into smaller pieces. Peel off the ginger skin and cut lengthwise (about the length of a thumb) into 3 or 4 slices. 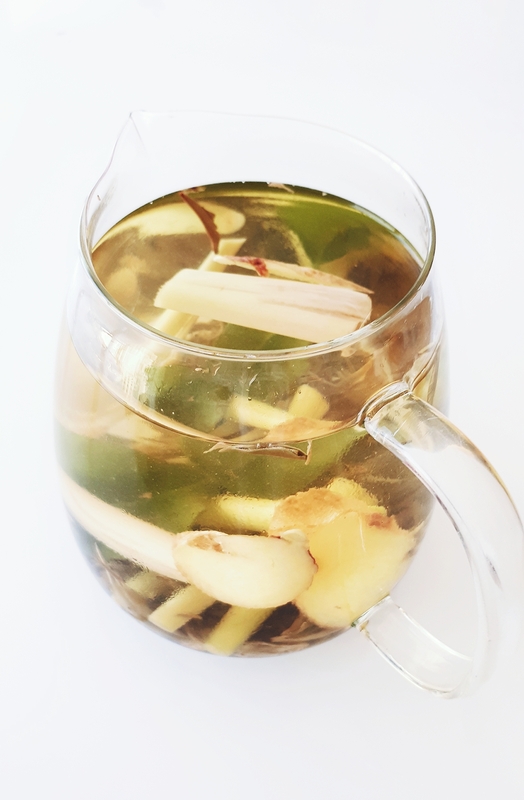 For a more robust flavor, add more ginger (however, this may dominate the delicate flavor of the White Tea). In a large saucepan, bring water, lemongrass, ginger, and 1 lime leaf to a boil. Remove the saucepan from the heat and cool off for 10 mins. Add 2 tablespoons of White loose leaf tea and honey. We recommend putting the loose-leaf tea into a strainer so you can remove it after it has steeped. Steep the White tea for 3 mins, making sure that the water has cooled off a bit, otherwise, it could turn the tea bitter if using boiling water. Remove the tea strainer and let it sit for about 30 minutes. Pour the tea through a fine-mesh sieve or strainer and add the remaining lime leaf into a pitcher or carafe. Make sure the tea is room temperature, not scalding hot. Refrigerate until cool. Pour over ice and top with mint or fresh lemongrass stalk. For a robust flavor, add more ginger and lemongrass; and leave on low heat for another 10-15 mins. However, this could dominate the delicate flavor of the White Tea. You may also consider using White Peony (aka Bai Mu Dan) instead of Silver Needle, as the flavors are earthier, complex and full-bodied. Alternatively, if you don’t have any White loose leaf tea, you can substitute with about 5 White Tea Bags or Green tea as well. For a Cold Brew version, follow steps # 1 to 3. Add all ingredients together with room temperature water, White Tea and honey. Refrigerate overnight. Do a taste test and adjust to taste accordingly, if it requires more brewing or sweetener. Pour the tea through a fine-mesh sieve & serve with ice. For entertaining, we like to keep the lemongrass, ginger & lime leaf in the glass carafe, refrigerated. It also makes for a nice presentation. If you do make this, let us see! 🙂 Tag your photo and share with #yvetteteas on Instagram.